In 1909 the entire world of dance changed forever when Les Ballets Russes, under the brilliant impresario, Serge Diaghilev, departed St. Petersburg and opened in Paris. They also made annual visits to the West End in London. 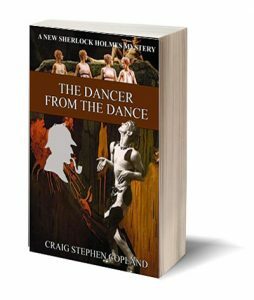 Tragically, during their 1913 tour, two of their dancers are found murdered. Sherlock Holmes is brought into to find the murderer and prevent any more killings. The story adheres fairly closely to the incredible story of the reappearance of classical ballet in Western Europe and the introduction of modern interpretive dance. It is a tribute to the original story in the Canon, The Adventure of the Dancing Men.